If you’ve ever been interested in the night sky and the wonders above our heads, search no further: your ultimate resource for all things in the universe is here. 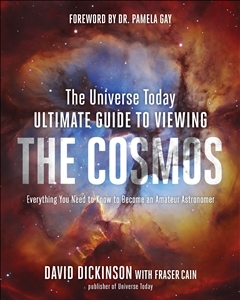 From David Dickinson and Fraser Cain, publisher of the widely popular astronomy news site, Universe Today, comes the complete guide of the night sky, ranging from the best tips and tricks for viewing, an overview of the solar system and our galaxy to exclusive interviews with top NASA scientists, interwoven with exclusive, beautiful photography from top night sky photographers (including Dylan O’Donnell). The foreword will be written by top industry professional, Dr. Pamela Gay. With calendars, charts and graphs, you’ll treasure this definitive resource for many night sky viewings from now and for years to come.